I have been updating charts on employment changes in New Brunswick for a while now, but sometimes it is useful to look at a longer term review of employment and labour force trends. Here are some charts using data from Cansim Table 282-0054 (Statistics Canada); they compare the five economic regions in New Brunswick with respect to labour force (those working or willing to work) and employment (those currently working full-time or part-time) for the period March 1994 thru March 2014 – 20 years. 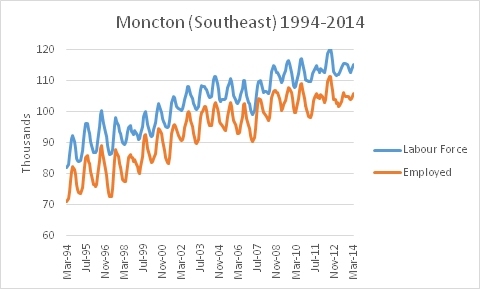 The graphs are ordered South to North; the three ‘urban’ regions (Saint John, Moncton, and Fredericton) are all in the southern part of the province. The two northern regions follow. 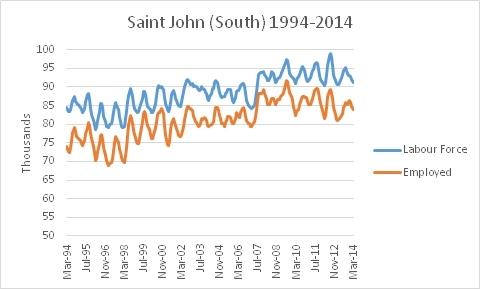 Saint John shows a fairly shallow upward trend, which flattens out around 2007. There have been ups and downs since then but no obvious resumption of upward growth. Moncton has done better than Saint John in terms of employment growth. After a ‘hiccup’ in 2006-2007, things improved markedly around 2007-2008 but have been fairly flat since then. 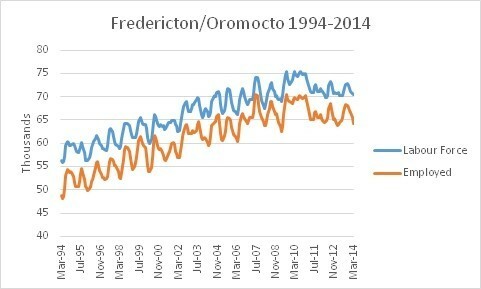 Fredericton has had fairly robust growth that peaked in 2007, dropped in 2008, then was buoyed up (perhaps because of stimulus spending in 2008-2009) for a short period. Since then a flat or downward trend. 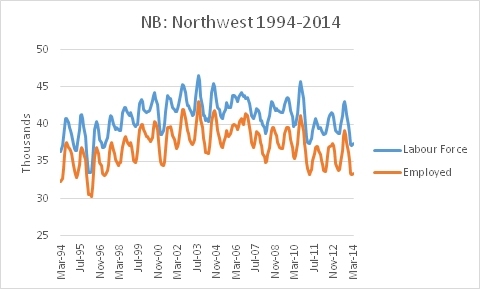 The Northwest also exhibited a shallow but positive upward trend until about 2003; since then a steady decline until about 2011 when things seem to have flattened out. Note the marked fluctuations in each year – that is likely a function of seasonal work. 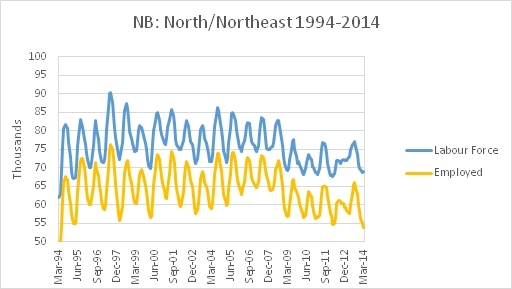 The Northeast has clearly been suffering economically for a long time, with some upward movement in the late 90s, but stagnation for a decade, followed by a marked decline. For comparative purposes, we can look at the same time period in other parts of the country. Kitchener-Waterloo is home to Blackberry (RIM). Blackberry’s decline as a smartphone/software supplier may have affected trends in recent years, but the region seems to have enough strength in other sectors or companies to weather the storm. Note that not only does there appear to be less seasonal fluctuation but, for most of this time period, a steeper curve; i.e. greater job gain over time. 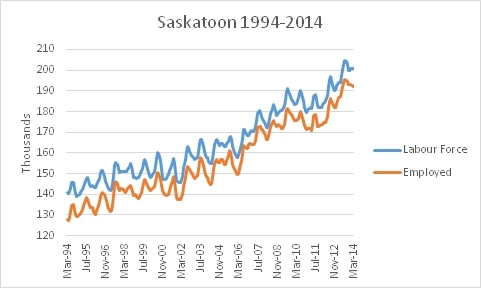 Saskatoon data show a shallow upward curve with obvious seasonal fluctuation for the first decade or so, but a steeper upward trend during the past decade. The small difference between labour force size and employed indicates that the unemployment rate is consistently low. 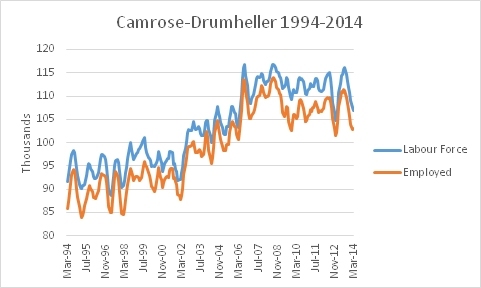 The Camrose / Drumheller region represents a rural area of Alberta (south and east of Edmonton) that is dominated by prosperous small towns. Rapid employment growth occurred in from 2000-2008, but has been flat since then, with marked fluctuations. Note that again, as with Saskatoon, there is not much of a gap between labour force numbers and employed numbers – relatively few are unemployed. For the purposes of this chart, I have considered non-CMA (Census Metropolitan Area) locations as ‘rural’. You can see that Moncton is, in terms of median family income, similar to Toronto; both are far higher than rural NB. Also, note that Calgary (not-surprisingly) is doing very well income-wise. Yes the cost of living is higher, but the income differences between there and here are huge. Finally, note that rural AB incomes are not only higher than in Moncton and Toronto, they are very much higher than rural NB. 1) Rural NB has suffered an economic collapse, and there is no sign of recovery. 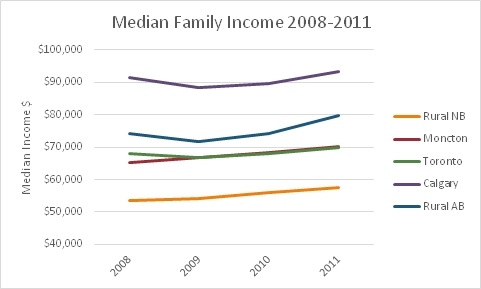 Median incomes are poor. That means paying for services received becomes more and more difficult. The forestry sector may rebound but technological advances mean many of those jobs will not come back. It won’t be enough to create jobs; they need to be jobs that come with healthy incomes. 2) Urban NB has been flat or in decline with respect to employment growth for several years with no real sign of a turn-around. For a few years, there was enough growth in urban areas to pick up some of the slack resulting from poor growth in rural areas. That’s no longer the case. Worse, there seems to be more seasonality in the jobs picture in NB urban centres when compared to other urban regions in the country. Not sure, but I would expect that seasonal employment would have a negative impact on median income. 3) We should not focus on job creation per se, but on encouraging creation of high-income jobs. Incentive programs, tax rebates, etc., should be targeting creation of high-wage jobs. Those kinds of jobs produce more of the tax revenue needed to keep current programs solvent. Despite the current provincial administration’s efforts to control spending, deficits and debt will grow unless we generate more tax revenue. 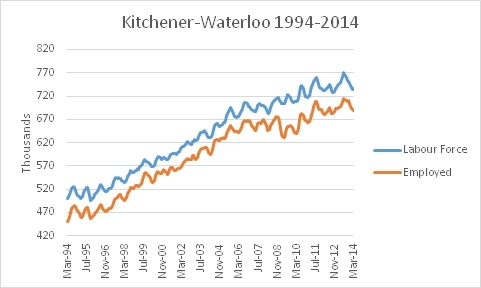 This entry was posted in Governance, Labour, Politics by Datapoints_NB102. Bookmark the permalink.